The circuit diagram for arduino and ultrasonic sensor is shown above to measure the distance. In circuit connections Ultrasonic sensor module’s “trigger” and “echo” pins are directly connected to pin 18(A4) and 19(A5) of arduino. A 16x2 LCD is connected with arduino in 4-bit mode. Control pin RS, RW and En are directly connected to arduino pin 2, GND and 3. And data pin D4-D7 is connected to 4, 5, 6 and 7 of arduino. Where speed of sound around 340m per second. A 16x2 LCD is used for displaying distance. 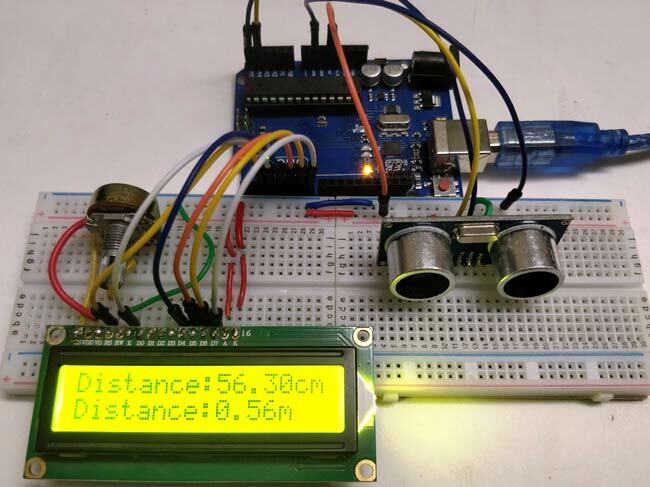 Find more about the working of distance measurement project in this tutorial: Distance measurement using ultrasonic sensor. In code we read time by using pulseIn(pin). And then perform calculations and displayed result on 16x2 LCD by using appropriate functions. Can you give me a distance meter flow chart. I think you should read the arduino.cc page for more about arduino. Its Arduino Pro Mini, as mentioned in Components section. i am also implement this type of projects but real time problem is how to mobile no is store through sms. and send the sms from gsm your mobile no is registered. second problem tx /rx pin. what pin are using tx and rx . Nobody can entered the this type of sms because sms is tool long . after send the sms through the mobile then sms memory is full how to delete the sms memory after gsm read the message . pl use eeprom header and use the eeprom memory in ardunio. then store the mobile no and you can easily change mobile no . You can connect to A6 and A7 but then define the Trigger and 'echo' pin accordingly. - Travel time = PulseIn(), gives results in microseconds. This has to be converted to seconds, therefore divide by 1,000,000 (1s = 1000000us). - The distance measure we want to display in cm instead of m. Therefore, multiply by 1000 (1m =1000cm). Why does this project use Arduino Pro Mini and all I was seeing from YouTube and other sites are Arduino Mega or Arduino Uno. Is there a significant difference? Does the code above really works? You can use any model, Code will work in all of them. Further Arduino Pro Mini is small in size and generally used on PCBs because of its size. Hey if I use ultrasonic sensor for moving robot then how it will be calculate the distance????? do u know method to modify this problem? we are making this project and our teacher asked if what is scale? We are planning to make this project and our teacher asked what is the used of Scale because it is in the components thanks. Scale is used to verifying the distance, check video. What should be the possible program and circuit if centimeter will change to feet? can i trans output of this sensor to 4 -20 mA? I’d like to measure human heights in clinic. Is this sensor sensitive to hair? I mean it is important to measure exact height in this case which requires measuring height till the end of skull also to prevent error occurs by hair. I mean height shouldn’t be dependent to hairstyle. can this ultrasonic sensor help me? hi can you tell me whats the model of lcd display used their? This site is helping a lot for me to easily understand all the arduino related projects and to do it myself. im tryn to make a blind stick using arduino nano with buzzer.but there is some error ...can u guyz help me...! hello, please is it possible to integrate a set of led bulbs to the circuit such that the led bulb comes on with respect to the distance of the obstacle.? if it is possible can someone help me out with the codes? Can u explain me what is the use of Potentiometer when we are using a Arduino uno/Why potentiometer is used inthe circuit? ?